In 2016 the quartet JAGD won the Amsterdamse Popprijs where the judges praised them for their energetic music and international potential. Meanwhile the group has spent many hours on stage, recently during Popronde, and even could free up some time to record a new EP. 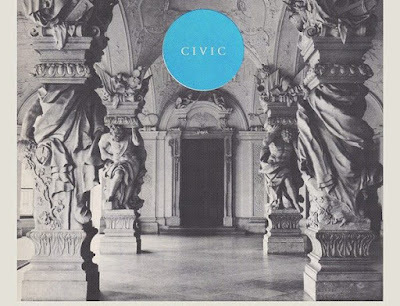 Civic holds four brand new songs that show what JAGD has to offer. And there's a lot on offer here, since despite the just over 15 minutes of music, it is firing up quite a lot of musical bullets. The four songs are chuck full of catchy punk rock that is hard to resist. The title song opens the record, a great track with a pleasant groove that completely explodes in the chorus. Explosiveness and excitement are exactly the qualifications that come to mind when listening to the band. But the foursome are able to prevent their music from becoming to predictable and overdone, by applying everything in the right quantities. A surf guitar is added to 'Elevate' and it has a calm intermezzo. When needed though the band goes completely crazy, fronted by singer Nanne van der Linden, who is sometimes screaming on top of her lungs. She's doing this with great effect in the racing song 'Overbored'. Finally they are going full force in the banging last track 'Awkward'. Indeed JAGD proves with Civic to be full of potential and deserves it to be heard. Live the band even picks it up a notch and is able to overwhelm everyone with lively performances. When the bookers in The Netherlands and around are paying attention they already have put JAGD on their list with a big marker. This band will definitely be a big hit on every festival around. This album discussion has also been published in Dutch on FestivalInfo.nl over here.